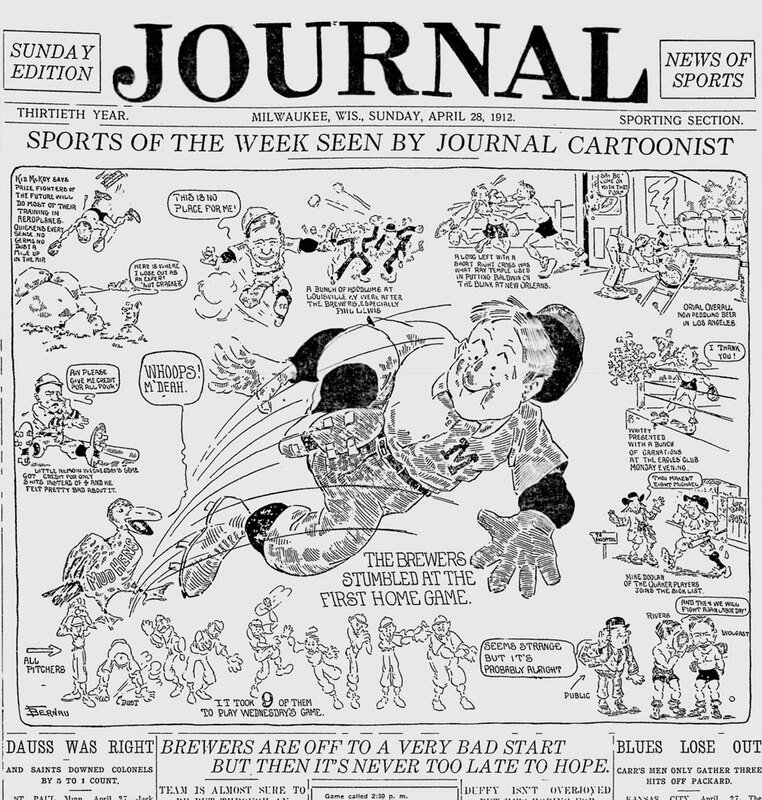 The 1912 Brewers, with new manager Hugh Duffy, opened their season with an extended road trip. They won 5 of the 12 games played before returning home for their home opener at Athletic Park one hundred years ago today, on Friday, April 26. The weather forecast for the 3:00 opener was "unsettled, probably with showers." There turned out to be no rain, but the wind "swept across the yard with all the enthusiasm of a Kansas cyclone." This kept the crowd down to a still-respectable 6,000 fans to watch the Brewers and third place (7 and 6 record) Toledo Mud Hens. In respect to owner Charles Havenor's memory—he had died only three weeks previous—the expected Opening Day frills and formalities were kept to a minimum. 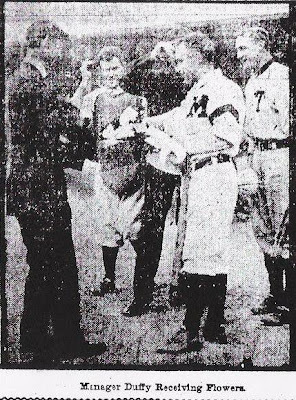 A hit with the fans was a man with a megaphone announcing the batteries in the grandstand before the game, Mayor Gerhard Bading threw out the first pitch—the first mayor to do this in a number of years—and Duffy was presented with flowers at home plate before the game. Note the black armband on Duffy's sleeve. Hugh Duffy had wanted to start his new pitcher, Cy Slapnicka, recently acquired from Rockford of the Wisconsin-Illinois League, but "the Athenian prince" did not arrive in time for the game. Duffy went with veteran John "Rube" Nicholson, "the husky son of Scandinavia." "If John sticks to his knitting this season, it looks as if the Brewers would have a twirler who would make the association batters break their backs to touch his benders. Duffy is a past master at handling unruly ball tossers and if anyone can get Nick to deliver the goods, Hughey is the boy." Nicholson would stay out of trouble enough in 1912 to win twenty games (with 12 losses) for the Brewers. On this opening day Big John lasted only one third of an inning, giving up four runs on three hits and two Brewer errors. 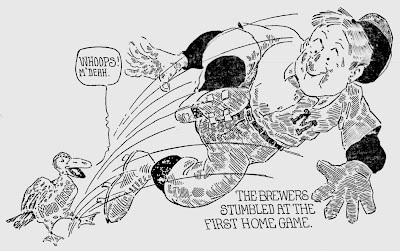 Right-hander Don Marion—who had toiled to a 4 and 8 record for the Brewers in 1911—took over, but allowed one more run to score in the inning. Marion settled down in the second, and the Brewers scored one in the bottom of the second on a double by Phil Lewis, who moved to third on an out and scored on an error by the Mud Hen third baseman. Marion continued to pitch well until the Toledo boys scored two runs in the fifth on a wind-blown triple by Ray Chapman over Nemo Leibold's head in center field. All and all, Marion pitched well, the Milwaukee Sentinel reporting he "had a world of speed and his curves broke with a beautiful snap." After one more run scored, Duffy called for Stoney McGlynn in the sixth to finish the game. The soon to be 40-year old veteran allowed a solo run in the eighth, then four runs in the ninth. This last outburst included another wind-blown triple, this time by Mud Hens pitcher Hy West—the ball started off in left center field, and finally landed over Leibold's head in straight away center field—and a home run over Athletic Park's left field wall by Ray Chapman. When it was finally over the Mud Hens had won 13 to 1, the Brewers having been "clawed, booted, hamstrung, tied in knots and then some," according the Sentinel's Manning Vaughan. 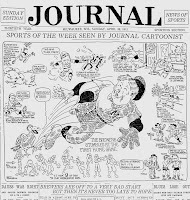 In its lead off story of the game the next day the Milwaukee Journal gave the definitions of Rotten, Inability and Bone-headed to its readers. Brewer pitchers gave up eleven hits, walked one batter and hit two more by pitches. The Brewer fielders committed six errors. The star of the game was the 21-year old Ray Chapman. The young Toledo shortstop went 3 for 5 at the plate--a single, triple and home run--scoring two runs, and driving in six. Milwaukee newspapers reported his play at short was a revelation, accounting for two assists and three put-outs. Chapman had played 1911 with Davenport of the Three-I League, hitting .293. Late in the season he was purchased by the American League Cleveland Naps and assigned to Toledo. Hitting .310 with the Mud Hens during the 1912 season he would go up to Cleveland later in the season, playing in 31 games, hitting .312. Ray Chapman would play in Cleveland until August of 1920, hitting .278 and playing a very good game at shortstop when he was involved in one of the game's most tragic events. He was hit in the head by a pitched ball from the New York Giants' Carl Mays on August 16, 1920 and died at the hospital the next morning, the last player killed during a major league game. In the second game of the home stand played the next afternoon before a crowd of 3,000, Ralph Cutting's "codfish ball" failed to stop the Mud Hens, as the Brewers dropped the game 6 to 4. The only real amusement of the game was an argument by the Toledo pitcher Irv Higginbotham and manager Topsy Hartsel over a balk call by umpire Charlie Ferguson in the fourth inning. "The conversation waxed hot, and judging from a few words which drifted to the scribes' coop, the ancestry of those concerned was discussed more or less freely." Hartsel and Higginbotham were asked to leave the park. The Brewers were winning 4 to 2 at the time, and as the hometown boys had been whaling on Higginbotham's pitching "in rare style" the pitcher’s ejection was the turning point of the game. These two games were all that were played in the scheduled four game Brewer/Mud Hen series. The third game of the series was rained out and a cold strong north wind caused the Brewers and Mud Hens to agree to call off the final contest.